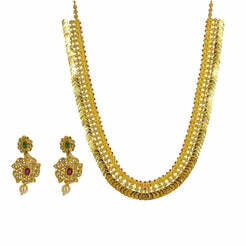 22K Yellow Gold Necklace and Earrings Set W/ Kundan & Floral Chandelier Design for women. 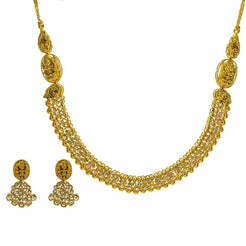 This elegant 22K yellow gold necklace and earrings set is ideal for dressy and formal attire. 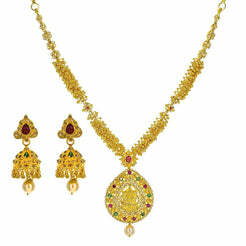 The set is embellished with Kundan and elegantly designed with floral chandelier designs cascading downward. This set has a total gold weight of 116.6 grams.